A trailblazing co-op in Reno, Nevada, released an app that introduces patrons to their farmers. How could other people get to do this – meet their farmer, the people responsible for their food – without coming to the farm? How can this happen with modern technology? Steve spent the next year creating the Meet Your Farmer app for the Great Basin Food Co-op, which Jolene managed at the time. 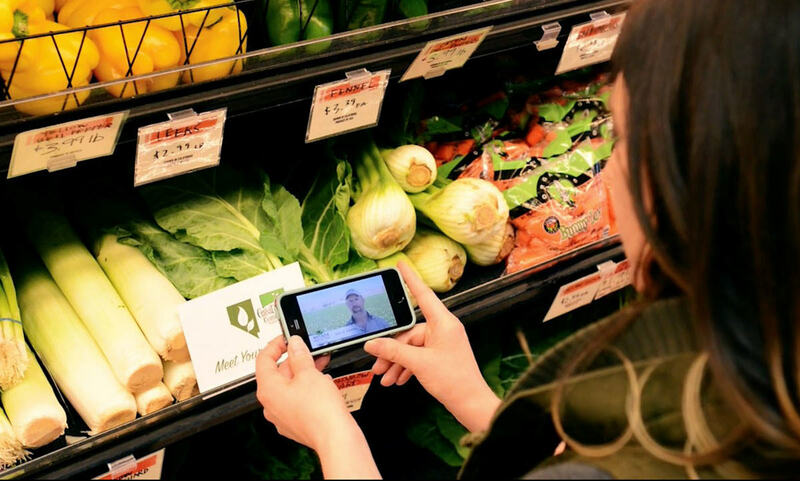 Shoppers download Aurasma (the augmented reality app that Meet Your Farmer uses as a platform), point their smart phone cameras to signs near locally produced food, and a video of a person they would otherwise have to meet at the farm stand or farmers market pops up. “A lot of people are interested in finding out where their foods are from but they don’t want to be lectured on it,” Steve says. The one minute, fifteen-second videos steer clear of the didactic route. While providing knowledge to patrons, the app gives farmers something else: A source of recognition that they wouldn’t ordinarily get. Long, hot days, drought-driven honey declines, and hundreds of bee stings a year shape the reality of Charlie Nash, a beekeeper whose product sells at the co-op. Along with Nash’s Al Bees Sierra Nevada Honey, the app showcases nearly thirty other producers in the Reno area. Megan Schmitz, a co-op patron and volunteer, is a self-proclaimed champion of the app. She loved it so much that she spent time introducing other shoppers to it in-store. “I was excited about connecting 2015 technology with farming. Meet Your Farmer marries the two, educating the public about where their food is coming from and building that connection,” she says. The user-friendly app has accrued fans and users with and without smart phones, thanks to the available iPads in-store. So what’s the future of the app? Steve plans on increasing the list of showcased farmers, and potentially rolling the app out to restaurants that get their food from co-op producers. Correction: The original article stated that Jolene Cook manages the Great Basin Food Co-op. Although she used to, the current General Manager is Amber Sallaberry, who also had a hand in bringing the app to life.